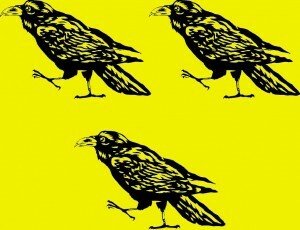 The name is based on some heraldry attributed to the family, or rather an element of that heraldry; three ravens marching across a gold field. Heraldry being an early adventure in brand logos, when I was entertaining notions of a business it seemed obvious to bring in an image I was already attached to. The name is not only descriptive of the picture, but carries with it connotations of being out on the edge of civilization; Saskatchewan and its capital, Regina, are typically viewed as somewhat out-of-the-way places, even in a Canadian frame of reference, despite the fact that we’ve got out own long-lived symphony orchestra, an assortment of live theatre options, arts venues, and sushi restaurants (including one that’s attached to a gas bar, which if not cosmopolitan is at least bizarre). The fact that ravens were associated through the efforts of Lewis Caroll with writing desks never really occurred to me until long after the name had set down roots in my head, but I do consider it a happy coincidence. Ravens, or at least crows, are also associated with very delicate writing and drafting; the crow-quill dip pen gets its name from the original material from which the pen was made. It is extremely hard, I should mention, to discover the correct heraldic blazon for a bird that is pedestrian. Standing, perching, or flying, and there’s descriptives galore, but walking? Nothing I’ve found.